The human body works the principle of "if you do not use it you lose it". If one does weight training, the person will grow muscle. If this same person stops weight training, the muscle will "atrophy", or get smaller due to non use. It will shrink to a size that will perform the job necessary but not more. The human bone works on the same principle. If the bone is stressed during weight training, it will grow to support the muscle. If there are teeth present, the act of biting will in a way exercise the bone and maintain its size. If, however, the tooth is lost, then there is no need for the bone to hold the tooth, and therefore the tooth will atrophy or shrink. Teeth and Dental implants stimulate the bone to remain in the area. With a tooth in place, the surrounding bone is stimulated with each bite. Extracting the tooth leaves a large area with no bone (extraction socket) that immediately causes the process of bone resorbtion. The affected area will continue to lose bone, and as much as 60% of the bone mass can be lost in the first six months. Bone loss continues with time. The rate of loss depends on various factors and is not the same in all individuals. Some people lose bone much faster than others. Eventually, the bone resorbs to a level where replacement of the missing teeth with dental implants is not possible. The back area of the upper jaw is in close proximity to the Maxillary sinuses. These are large empty areas that are in the upper jaw. In this area the bone atrophies from the ridge as usual. It also atrophies by the expansion of the sinus as demonstrated by the movie. 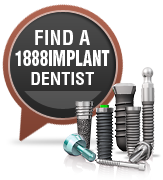 This makes dental implant placement more difficult due to early loss of available bone. Multiple tooth bone loss results in atrophy of the missing tooth area. In the example above you see the atrophy of the lower right side of the jaw area where teeth are missing. Note how the nerve comes closer and closer to the top of the ridge as the atrophy increases. If teeth are lost, the bone in the area will atrophy. The example above shows the progressive bone loss that occurs when all the teeth in the lower arch areas have been lost. Note how the atrophy becomes extreme after a period of time, to the point of even exposing nerves that were originally imbedded deep in the jaw bone. Full facial bone loss is when both top and bottom jaw atrophy happens in a patient. Note the significant loss of lower face height as well as the sagging wrinkled look of the lower face. Atrophy of the supporting bone is a major factor in premature aging.